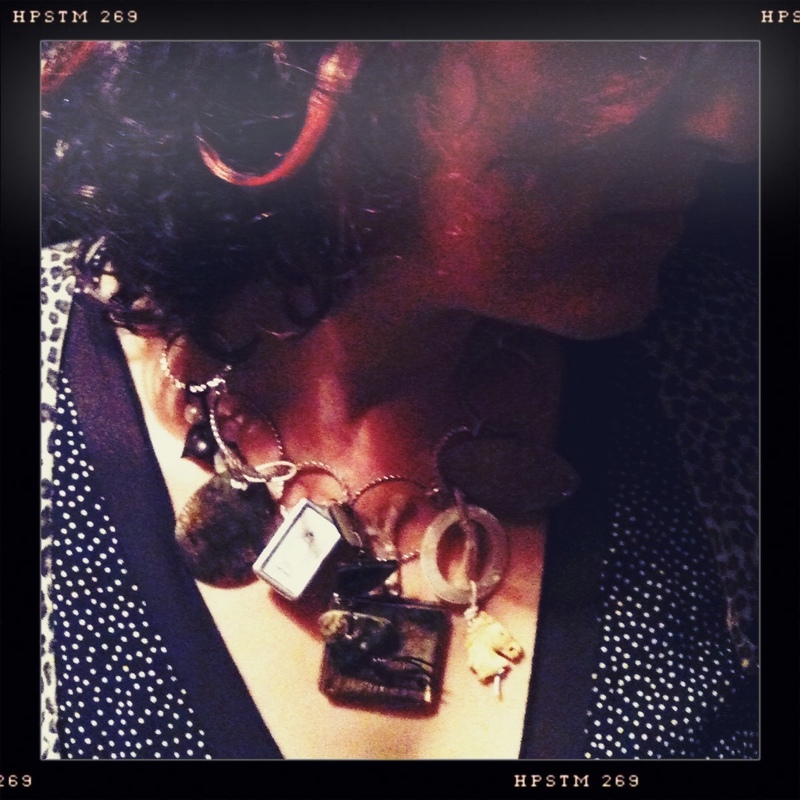 Today I wore two necklaces (as promised) but honestly, I do this a lot. The shorter choker is from the old days and I made it as part of a collection I did for Bedizen called Vegas Wedding. We had a lot of love- and wedding-themed charms and that desert palette. 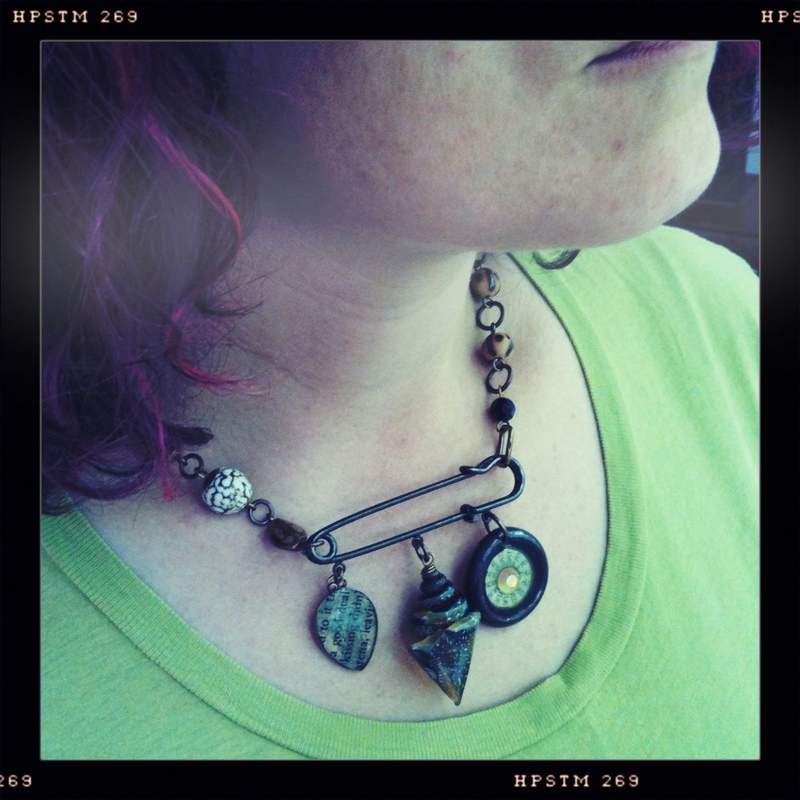 The necklace is strung on memory wire, a product I really like for making chokers. It can be worn with out actually choking the wearer. 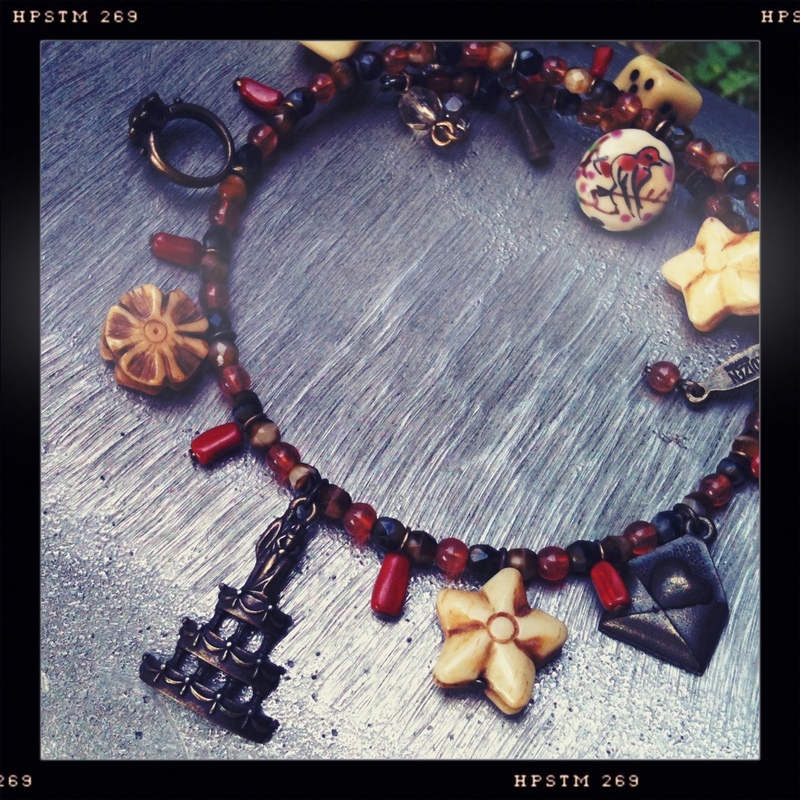 Those beads are a mix of Czech glass and some vintage 40’s carnelian glass rounds that I had a 10 lb. bag of at one time. I used them in so many collections I thought they’d never run out. Sadly, they did. Bone dice, stars, flowers are from China. The small red beads that are coming off the memory wire strand are real red coral from back before we realized we shouldn’t be making important animals like coral into beads. Those painted ceramic bird beads? I had forgotten all about them and now that I remember them I dug out the name of the folks I purchased them from. I think I need more. 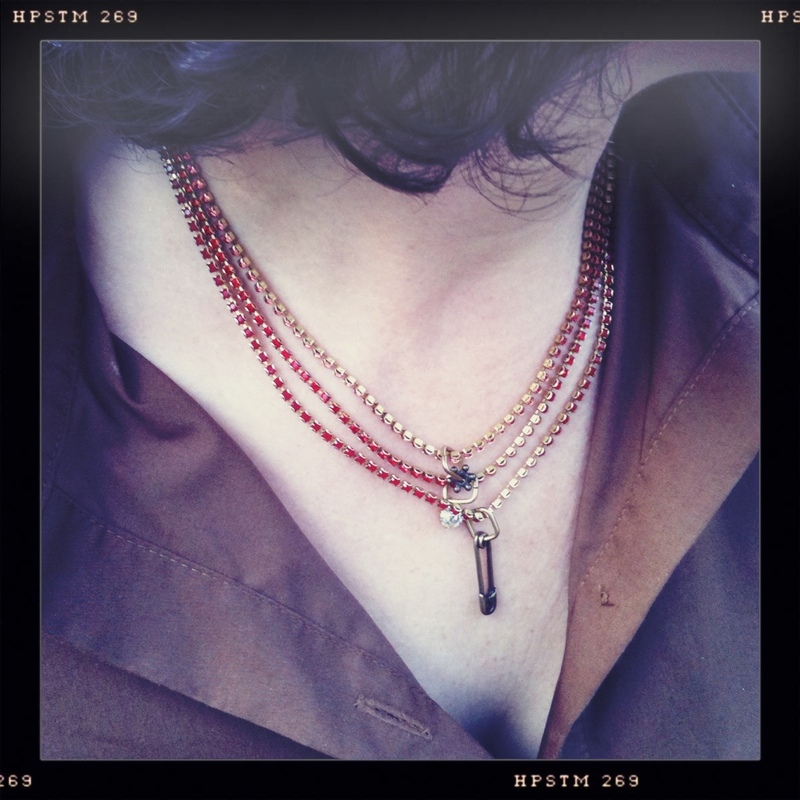 The orangey long necklace is made of many, many strands of silver-lined red glass beads. It’s really a hank; strung on cotton thread and knotted. It was a gift from a friend after I came to her wedding ceremony. It’s really pretty and I don’t know if she knew I would wear the hank just like that or she thought I would restring it. I like it as-is. It’s a perfect summer necklace as it’s bright and really disco-looking but also doesn’t actually match a single thing I own. Currently that ‘not quite matching’ element is very appealing to me. 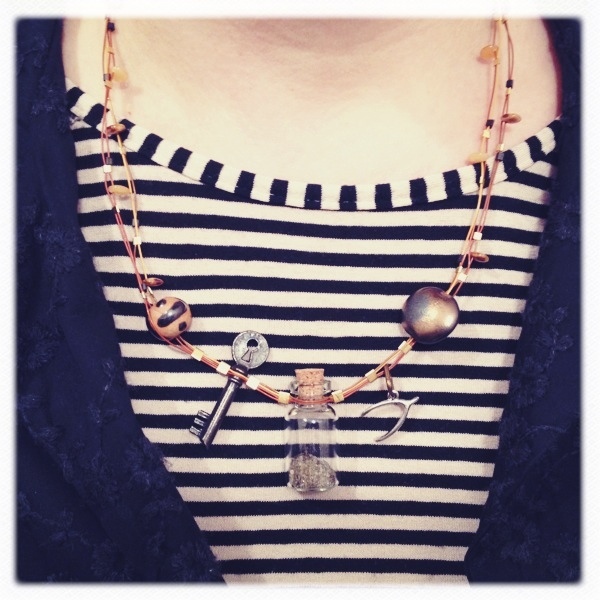 For directions for constructing this necklace are available see the Projects page. 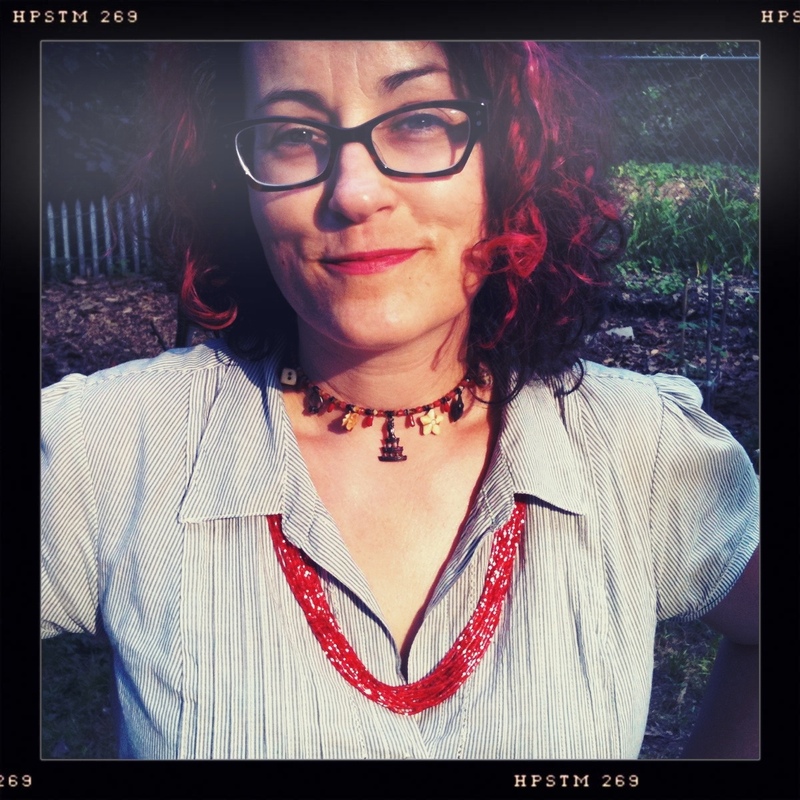 A few years ago I happened upon this orangey-red Zodiac stone at a vintage jewelry sale. The gold-enhanced intaglio design features Cancer, the Crab. While I’m not a believer in Zodiac principles, I do often use the signs of family members as symbols for those individuals. My husband has a June birthday and the color of this vintage stone made me happy so I bought it. The stone lay on my work table for quite a while until one day I decided to pair it with that wire-wrapped crystal rhinestone. The 20″ brass chain is finished in the back with a spring-ring clasp and I wore this necklace for quite a while with only the Cancerian stone and rhinestone ball. 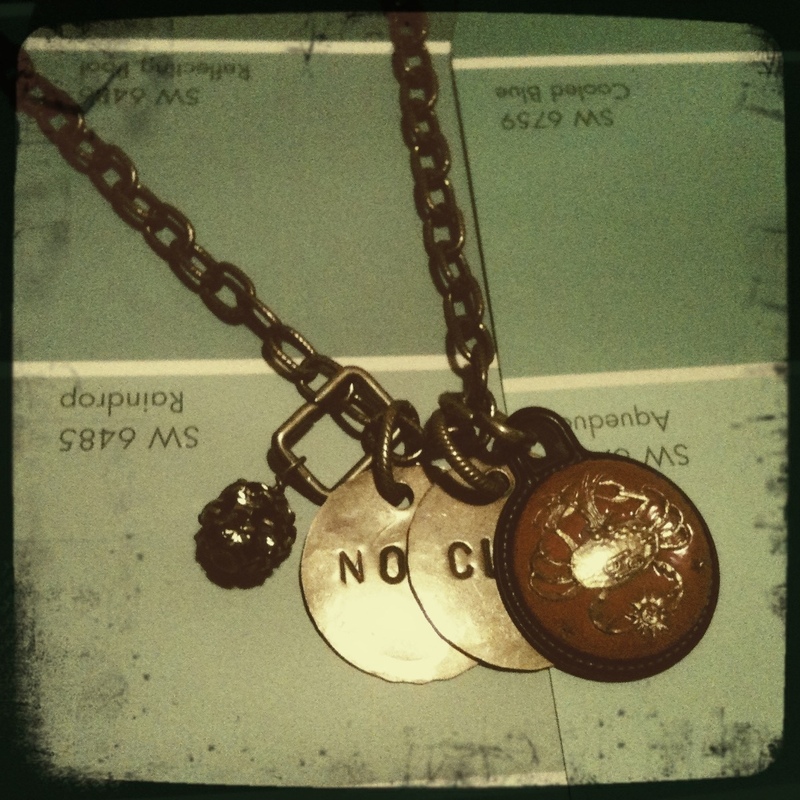 One day I stamped small brass discs with my daughter’s names and added them to the necklace. 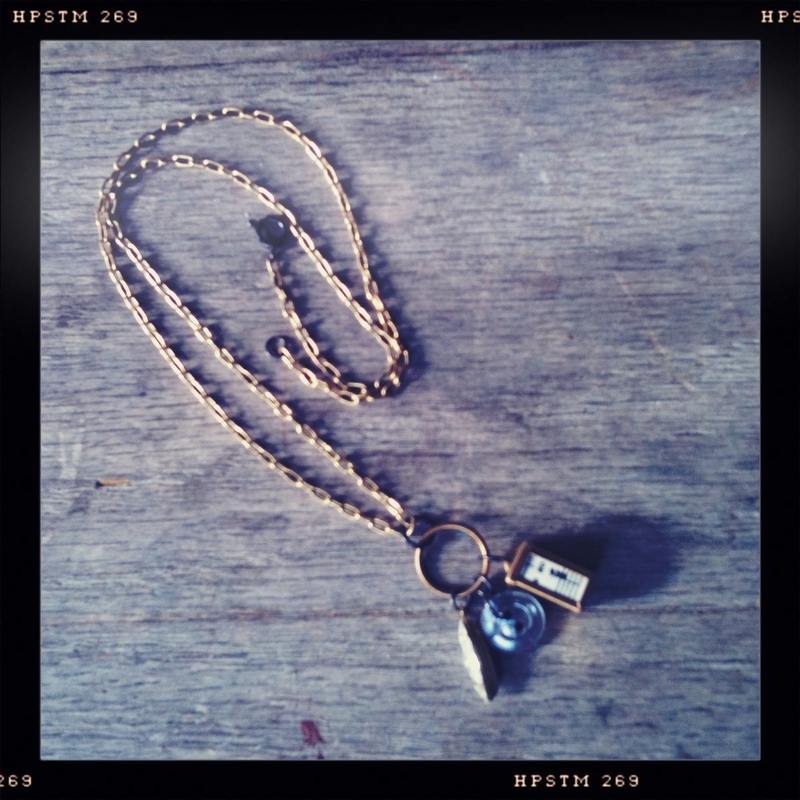 I’ll miss this necklace a lot this year. I wore it frequently. The combination of meaningful symbols and favored color (and that bit of sparkle!) made it right with so many outfits.